TAMPA, Fla. (AP) — Tampa Bay coach Jon Cooper grudgingly gave up the news. Injured goaltender Ben Bishop will not play in Game 1 of the team’s Eastern Conference playoff series against Montreal, however the Lightning doesn’t feel they’ll be at a disadvantage with backup Anders Lindback facing a more experienced Carey Price and the Canadiens in the best of 7 series that begins Wednesday night. Lindback won three games after Bishop was lost to elbow injury last week, keying a surge that enabled Tampa Bay to gain home-ice advantage in the first-round matchup. The Lightning won three of four low-scoring games against Montreal during the regular season, and they expect more of the same now that the stakes are higher. "I think a lot of people, prior to Ben going down, thought this was going to be a big-time series in net. I think it’s still going to be," Cooper said Tuesday after practice at the St. Pete Times Forum. Bishop set Tampa Bay franchise records for victories, goals-against average and save percentage this season, while Lindback was much less effective until his team needed him most. The 25-year-old from Sweden stepped in after Bishop was injured to stop all 25 shots he faced in a victory over Toronto, then beat Philadelphia and Washington over the next five days to lift the Lightning over the Canadiens for the third-best record in the East. Cooper began his news conference by saying there was no update on Bishop. Nearly 10 minutes later, he conceded the starter is not ready to return. "Carey Price is an elite goaltender in this league. But I think in the same breath we have that on our end. And even though Ben’s not going to be around for Game 1, I think what we have is a goaltender in Anders Linback who has done nothing but bide his time, work his tail off, be a great teammate, and to tell you the truth I think our guys are cheering for him," Cooper said. "Those weren’t layup games. We still had something to play for. The other teams had something to play for," the Lightning coach added. "He’s done nothing but rise to the occasion." Price went 34-20-5 this season and has a big edge over Lindback in playoff experience. The Montreal goaltender has appeared in 30 career postseason games, compared to the 13 minutes of playing time Lindback got in his only previous exposure to the playoffs in 2011 with Nashville. "He’s the type of guy if he see the puck, he’s going to stop it. One of the best goalies in the world, there’s no question there," Lightning forward Ryan Callahan. "We’ve got to try to get traffic in front of him, and try to make it hard on him to see." The Canadiens practiced at home before flying to Florida on Tuesday. One of the focal points this week has been trying to fix the problems they’ve had scoring on the power play. In addition to going 0 for 23 over the last eight games of the regular season, they were 0 for 14 in four meetings with Tampa Bay. One of the reasons the Lightning are confident they can win without Bishop is they’ve already weathered a stretch in which they played 45 games without Steven Stamkos, who broke his right leg in December. Despite being sidelined until after the Olympic break, the high-scoring forward finished with 25 goals and 40 points. The Lightning have 14 players who could make their postseason debuts during this series. They had eight rookies appear in at least 41 games — five more than the next closest team. They’re also led by Cooper, who’s in his first full season leading a NHL team. "Like I’ve said before, I’m a rookie to the NHL, but I’m not a rookie coach," said Cooper, who coached many of Tampa Bay’s young player in the minors. "I’ve been a part of teams that have played in June. … We’ve kind of been through this together." The Canadiens have won 24 Stanley Cup titles, though none since 1993. 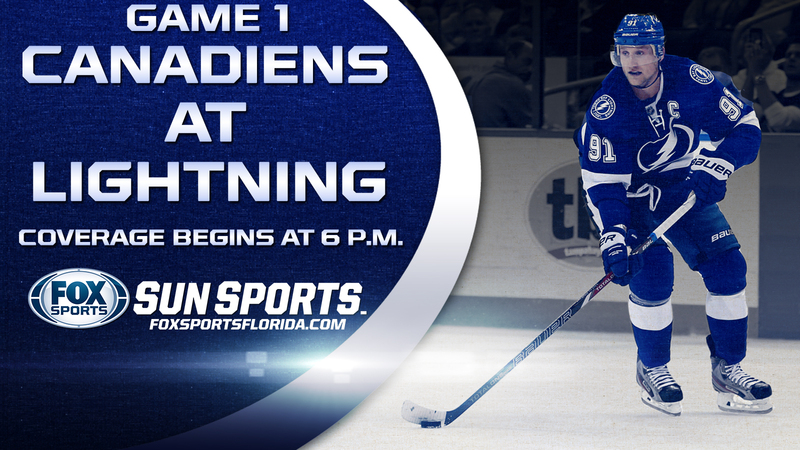 The Lightning swept its only previous playoff series against Montreal on the way to winning their lone NHL title 10 years ago.